A couple of weeks ago we brought you the first high quality group of teasers of the car that will replace the mighty Ferrari Enzo including shadowy shots of the front and rear end along with the first appearance of what appears to be the official name – the Ferrari F150 – and now a bit of information has been posted on the company website. The information on the upcoming heir to the Enzo throttle comes by means of a special page on the Ferrari website that is titled “Special Limited Series” and it is on that page where the Italian supercar builder has offered up some interesting bits of information including what seems to be the official name of the car, surprisingly named the Ferrari F150. In addition to the shadowy front and rear shots of the F150, this page has a section titled “The Waiting” which runs through the history of the Ferrari range topping supercars along with a page titled “Solving the mystery”, which offers a few juicy bits of information on the F150. First off, the company website explains that the new Ferrari F150 was designed by a group of engineers from the world of F1 and GT racing including Scuderia Chief Designer Rory Byrne. 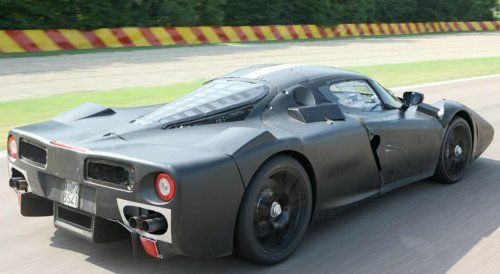 The carbon fiber monocoque that debuted earlier this year is both designed and produced in house with four different kinds of the lightweight building material while a design theory developed for the F1 racing program helps to make the F150 27 percent stiffer than the Ferrari Enzo. The batteries for the HY-KERS electric assist system are mounted just behind the driver with a low position to help provide a lower center of gravity. In the end, the F150 will feature the same right height and wheelbase as the current Ferrari 458 Italia even though the F150 will pack a HY-KERS drivetrain featuring a massive V12 engine. Next, the upcoming Ferrari F150 will feature a fixed driver’s seat that will be custom fit to the driver’s height when the car is ordered. While the seat will not move once installed, the F150 will feature an adjustable pedal box and steering wheel so there will be some level of adjustment but it sounds as though a Ferrari F150 ordered for a driver who is 5’5” will be pretty hard to drive for someone who is 6’2”. Furthering the low center of gravity, this fixed driver’s seat is mounted so close to the ground that the driver’s feet are at the same level as his rear end – bolstering that F1 race car feel. Finally, the Ferrari website explains that the upcoming F150 supercar (or should we say, hypercar) will indeed be powered by the same 6.3L V12 engine that produces 740 horsepower in the Ferrari F12 Berlinetta but based on the wording – we would expect that the F150 will offer more than 740 horsepower from the gasoline engine. Adding additional power while also improving fuel economy and reducing vehicle emissions is the newest version of the Ferrari HY-KERS electric assist system. The company claims that this hybrid assist system works to shave roughly 10% off of the 0-125 mile per hour mark when compared to a vehicle not using the HY-KERS system. More importantly to some, the HY-KERS system also helps to reduce engine emissions by some 40% - a significant reduction for a car with such incredible amounts of power. Finally, the Ferrari website offers a range of images of the new F150 supercar including shots of the test mules wearing awkward body panels to disguise the actual look of the new supercar (as shown above on the right), shots of the carbon fiber monocoque and a look at the interior being developed at one of their facilities. Click here to visit the Ferrari website for a look at all of this exciting new information on the upcoming Ferrari F150 supercar. Click here for a look at the images of the new Ferrari F150 from the official Ferrari magazine.